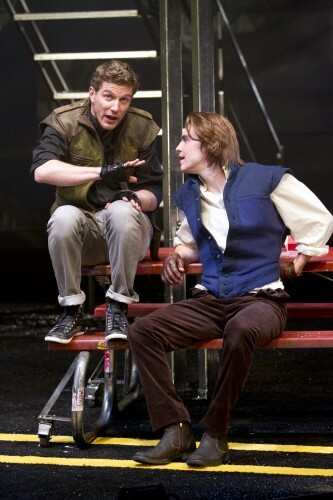 Nick Dillenburg as Proteus and Andrew Veenstra as Valentine in the Shakespeare Theatre Company’s production of The Two Gentlemen of Verona, directed by PJ Paparelli. Photo by Scott Suchman. For best friends Valentine and Proteus (Andrew Veenstra and Nick Dillenburg), the raucous bromance of youth is about to be disrupted by love – Proteus for Julia (Miriam Silverman), Valentine for Sylvia (Natalie Mitchell), then Proteus for Sylvia and back again. Leaving behind the parking lots of suburbia for the glamorous clubs of the big city, they’ll find alliances challenged and changed by the heightened risk of falling in love and growing up. When the plot’s laid out this simply it does scan like a teenage romance movie, though the reverberations of greater works to come – a bit of Romeo in Valentine, a shade of Iago in Proteus – suggest more depth than you might initially think. But above all, Two Gentlemen is a comedy, and the boys’ servants provide a lot of it. 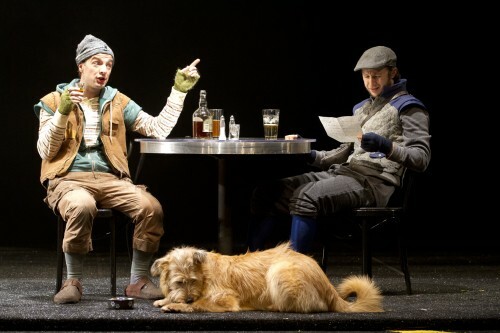 Valentine’s skateboarding messenger Speed (Adam Green) and Proteus’ woeful courier Launce (Euan Morton, bravely playing off a scene-stealing dog) keep the mayhem in balance with brilliant comedic timing that proves Elizabethean humor can still get laughs. Paparelli’s concept is ably aided by Walt Spangler’s glitzy design, all gleaming metal and thrusting catwalks, like a disco dystopia. Paul Spadone’s risky Elizabethean hybrid costumes add a touch of 1980′s music video kitsch. And a special nod to Fabian Obispo’s sound design for taking risks (how do we know Proteus is the one who’ll turn bad? He listens to Rage Against the Machine!) that caught the audience off guard. Though at times the modernization rings painfully earnest (anguished arm cutting during a U2 cover borders on the excruciatingly earnest, though it does serve to alert the viewer we’re about to go somewhere much darker), its pay off at other times is rich. The vigor of the actors’ commitment to making the text immediate and vibrant makes this a powerfully funny and poignant production. Their conviction to bringing the forceful danger of fickle youth to life make for moments of truth you wouldn’t expect from a “lesser” Shakespeare play. It comes through with a punch to the gut when the comedy turns. It’s both hilarious and hopeful, just like those coming-of-age movies you made light of but secretly loved. The Two Gentlemen of Verona performs at Shakespeare Theatre Company at the Lansburgh Theatre now through March 4. The Lansburgh is located at 450 7th Street NW, Washington, DC 20004. Closest Metro stop: Archives/Navy Memorial (Yellow/Green lines) and Gallery Place/Chinatown (Red/Yellow/Green lines). For more information call 202-637-7000.